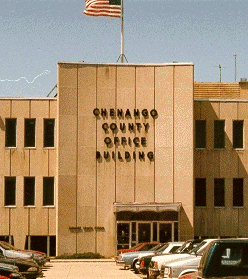 To serve the public by providing a full service Department of Motor Vehicle Office for Chenango County and all New York State residents. Mon - Fri 8:30 AM to 5:00 PM. Commercial Class A, B and C - for trucks 26,0001 lbs. or more and buses (minimum age 21). There are endorsements and restrictions depending on the type of vehicle driven and cargo. If you have other questions or need more information, you can call the State DMV at: 1-518-486-9786 (out-of-state call: 1-518-473-5595) or visit their web site: here. If you need forms, they can be downloaded from the State DMV site here. If you need publications, they can be downloaded from the State DMV site at: here.